Enga Amma Rani (English: Our mother is a Queen), is a 2017 Tamil-language horror drama film directed by S.Bani, starring Dhansika in the lead role and Yoganathan Maniam as guest role. Ilaiyaraaja composed the film’s score and soundtrack. 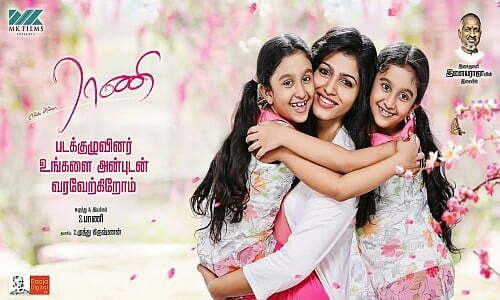 The film’s tagline says Enga Amma (Our mother) and Dhansika plays the mother of two daughters. Enga Amma Rani begins as an emotional drama but along the way, there is a twist that turns into a horror film. The problem is that this twist isn’t pulled off convincingly, leaving us underwhelmed. The film is set in Malaysia and revolves around Thulasi and her twins, Meera and Tara. Her husband Sathya is missing, and she cannot return to India, because of some visa complications. But she soldiers on, but then, one day, Tara dies, all of a sudden, and to make matters worse, Thulasi learns that Meera, too, has the same medical condition that took Tara’s life. On the advice of a friendly doctor, she takes the little girl to a hill station, but there, the girl starts behaving in eerie ways. What’s really happening? In Thulasi, Bani gives us a female lead who doesn’t break down because of her plight, but realises that life must go on and slogs through each day with determination and hope for the sake of her kids. This is, perhaps, the biggest takeaway from this film, along with Sai Dhanshika’s performance, which lends enough gravitas to make us feel for her light. In the first half, Bani gives us enough questions to make us wonder what will happen next. There is Sathya’s mysterious disappearance; even Tara’s death initially feels like a case of medical negligence; then, there is the bitterness between the couple’s families, back home in India; and we also have Thulasi’s conundrum after she learns of Meera’s illness. And yet, the director chooses an angle that is perhaps least interesting — possession by a spirit. Even here, initially, he raises hope and makes us think we could be seeing a slightly different horror film, like the underrated 2015 film, Baby, which also involved a ghost and two sisters. But he doesn’t explore the juiciest conflict here as well… What makes a person — body or soul? Instead, he gives us a very conventional ghost story that is lacking in both surprises and scares.